The concept of Gargoyles started between the 11th and the 13th Centuries. Their purpose was first to scare off evil, and second as a fancy way to divert rainwater. 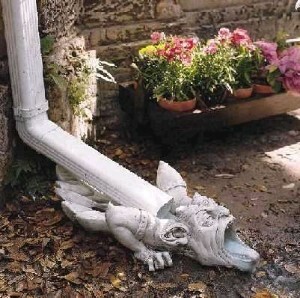 Many have open mouths because they also functioned downspouts to divert rainwater from foundations. As a result, many of the early Gargoyles also had rather long necks. The word "Gargoyle" originates from the old French word "Gargouille" meaning "Throat" but which also fairly well describes the gurgling sound of water coming through the downspout. The Catholic Church originally used Gargoyles as a scary visual reminder to behave for their Pagan converts, many of whom were illiterate. They were something of a "sermon in stone", or a warning of sorts to teach the people how to behave in a non-written way. They are now pretty much ornamental and assume many different forms. Most gargoyles are grotesque, but stone carvers in the past also honored relatives and friends by carving their faces into them. As they evolved, they morphed into often very elaborate statuary. .....Faces with multiple smaller figures and one large figure, or one figure with mouth agape and protruding tongue - symbolizes the insignificance of the individual and how vulnerable we are to larger powers. .....Detached heads - A real practice of the Celts, who were head hunters. They worshiped the heads they severed and believed these heads held supernatural powers. .....Ambiguous gender and species - Specimens again date back to the Pagans. The Pagan religions existed to overcome chaos and peril. These Gargoyles are representative of the fear of the unknown. This type of Gargoyle is now known as "Grotesque." .....Head entwined with branches and leaves - A branch coming out of the mouth or surrounding the head was a sign of divinity to the Celts. The Druids often depicted oak leaves, as the oak was sacred to them. This is often referred to as the "Green Man" today. .....Sexual Themes - Used by the Pagan religions as symbols of fertility. If used on outside walls, they were thought to discourage evil. Again, we go back to the universal fear of sexuality that exists even today.